Truthfully, this piece really shouldn't even be about the film many might've heard of already, per se -- but rather the joy of staving off the anxiety of watching a film that's been intriguing you from the get-go and waiting -- and waiting. Not because you're fearful that the film might be bad, or gross, or awful, or just plain boring -- but just for the sake of not having the time, or the energy, to manage such a nasty thriller like V/H/S 2, the follow-up of the first found footage sensation flipping the genre on its head and taking an old nostalgia and propelling it into the heart of horror storytelling. I'm tellin' you -- this V/H/S stuff got me trippin' and definitely broke a few blood vessels with horror stories reminiscent of another phenomenal collection of crazies like the "ABCs of Death" (and its subsequent sequel, of course). I'll be honest: splatterpunk isn't my top horror sub-genre. I respect it. I enjoy it. I thrill at some Ketchum, honestly, but the material in splatterpunk isn't for the faint of heart, and you've got to be prepared for the adrenaline rush and the blood to boil with some feverish imagery. As in, I would have to take some protein pills before watching any splatterpunk. That's part of why I ended up waiting so long after V/H/S 2 came out (I only watched it a couple nights ago). And I'm glad I did. Because the experience was that much richer. I even read a review about the film literally months ago and didn't remember much about any of it, so I watched the film completely fresh, no spoilers, nothing. And it was glorious. Truly a masterful creation of stories designed to paralyze us, freak us out, and make us ask that question we all love to ask: what if? After all, it is about recording. And I don't know any normal human being who would record anywhere around two hours worth of film. 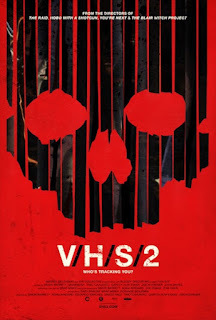 Call me crazy, but the V/H/S series (so far) seems to take the sub-genre at its best and make it work in its favor -- in those small spurts. Potentially better than any of the other fare out there. That's just my opinion (we'll see if the new "Blair Witch" will change all that, for better or worse). Keep this sub-genre of horror coming if possible. This keeps everything quite fresh in my opinion, as long as they don't make it all gimmicky, cheesy, and dumb like some of the entries we've had in Hollywood trying to take advantage of it.